Blood Work | Do I look like I play board games? Hope everyone is enjoying the summer! We’ve been busy at the Toxic Bag campus, working on several projects. But we did take a weekend off to enjoy our love of horror movies at Flashback Weekend 2017. As you can see, this year was a celebration of “A Nightmare on Elm Street” with a bunch of actors from all the installments present. For me, it was all about the original Nightmare and Nancy Loomis. I broke out my movie posters and set out for a long day of waiting in line! First up, was Freddie Krueger, himself, Robert Englund. Since he was the headliner for the show, he had huge lines of people to get his autograph. I waited about 3 and half hours in two separate chunks to meet him! With so many people, there was not a lot of time for chit-chat, but Mr. Englund was very pleasant and engaging. Plus, in addition to his signature, he drew a really cool picture on my poster as well! Robert Englund starting to draw a cool pic on my poster. Next up was Ronee Blakely. When she saw the drawing the Robert did, she said that she could try and do one as well but she’s not much of an artist. To prove her point, she then showed me a sheet of paper that she had made some doodle attempts on. We commiserated on the fact that neither of us can draw a lick! Ronee Blakley signs my poster. Next was Nancy herself, Heather Langenkamp. She was friendly and upbeat and came right out from her table to shake my hand! Very cool! It’s Nancy! The delightful Heather Langenkamp! The last original cast member at the show was Amanda Wyss. As we were walking up to her, we went over some of the great films she’s been in besides Nightmare. Fast Times at Ridgemont High, Better Off Dead, and of course, Silverado. Joe and I debated asking her to sign my poster with a movie quote from Better Off Dead, or Fast Times. I ultimately decided to go with Nightmare. Amanda was amazing! She answered my questions on her films and even asked us a bunch as well. It was fascinating to hear how uncomfortable the body bag scene was for her, not being able to breathe or see! Last but not least, was Nancy Loomis. Nancy was a John Carpenter player, appearing as Annie in the original Halloween and Sandy in The Fog. It was very cool to actually meet one of the actors from one of my all time favorite films! She told several great stories about working with Janet Leigh, and if she ever saw Adrienne Barbeau while shooting the Fog. (They never appear on screen together!) Nancy now teaches acting in California. Nancy Loomis signing The Fog. OMG! It’s Annie! Hey Jerk! Speed Kills!!! All in all, an amazing show! Can’t wait for next year! What are the chances we can get a “Return of the Living Dead” Reunion??? Greetings fellow gamers! Hope you had a fun and happy Thanksgiving! Besides consuming unhealthy levels of turkey and stuffing, the lads from Toxic Bag were fortunate to attend all three days of the Chicago Tardis Convention. This show, held in Lombard, IL, is one of the largest Doctor Who conventions in the midwest. Here’s a quick recap of the 72 hours of all things Who. It was really great to get a chance to meet all of these folks from the early days of Doctor Who. All of them had great stories about William Hartnell, Patrick Troughton and Tom Baker. Most of them are currently working with Big Finish to produce new Doctor Who audio adventures as well! Peter Purves and Anneke Wills discuss working with the original Doctor, William Hartnell. Frazer Hines, Deborah Watling and Wendy Padbury share memories of the second Doctor, Patrick Troughton. We were able to load up on autographs from all of these lovely folks! I had them sign my vintage Spirit of Light portraits while Joe had a cool picture of all the incarnations of the Tardis. Our friend Jodi presented them with an actual Tardis for signing. Anneke Wills getting ready to sign my portraits of Doctor’s one and two. Peter Purves inspects Joe’s Tardis Artwork. Note in the right corner, my friend Jodi, also recording this moment! Frazer Hines signing on Patrick Troughton’s shoulder. Wendy Padbury signing Jodi’s Tardis. Note all the signatures already on it! There were several really cool panels. We got to hear some great stories of how 1960’s television was made and the problems these actors and artists had to deal with. Peter Purves, who was on the show for the third season back in 1965, told us that back then, they didn’t have the budget to stop the action and edit. So, they basically had to perform these shows like a stage play. No stopping, if an actor forgot a line, they had to get back on track on their own! It’s almost hard to believe that they did it that way, but that’s the BBC in the 1960’s for you! The Big Finish guys also had a great panel where they broke down how they produced their audio adventures, and also discussed the future of Big Finish. Lisa Greenwood, Louise Jameson, Wendy Padbury, Deborah Watling and Anneke Wills discuss life on the Tardis. Elliot Chapman, Peter Purves, Fazer Hines and John Lesson share stories of Doctor Who. The Big Finish Panel. Left to Right: Jason Heigh-Ellery, Lisa Greenwood, Tim Treloar, Elliot Chapman and Nigel Fairs. Of course, what would a Doctor Who Convention be without cosplay! Here are some of the highlights. All in all, it was great show that flew by way to fast. All we can do now is get ready for Chicago Tardis 2017. The show runners gave us a hint on what to expect for next year: Think 1980’s! Better start working on that Adric cosplay now! Here’s the link to that article in the New York Times on the Star Wars fans that are going to camp out in front of their movie theater. Hope everyone has a safe and happy Holiday season, and enjoy Star Wars! Here are the links to the stuff we talked about in the August Podcast. It’s been over a year since we made Specimen available in print-n-play form. Since then we’ve continued to work and improve it. Right now we’re working on an expansion for Specimen as well as a brand new companion game involving the rescue mission sent from DeLeo-Kaga. In order to do these things, we needed to find out what happened to our Ship, Crew and Specimen in universe. Now, we could have just made it up, cause we’re clever about stuff like that. But instead, we decided to play the game and have the results be what happened. 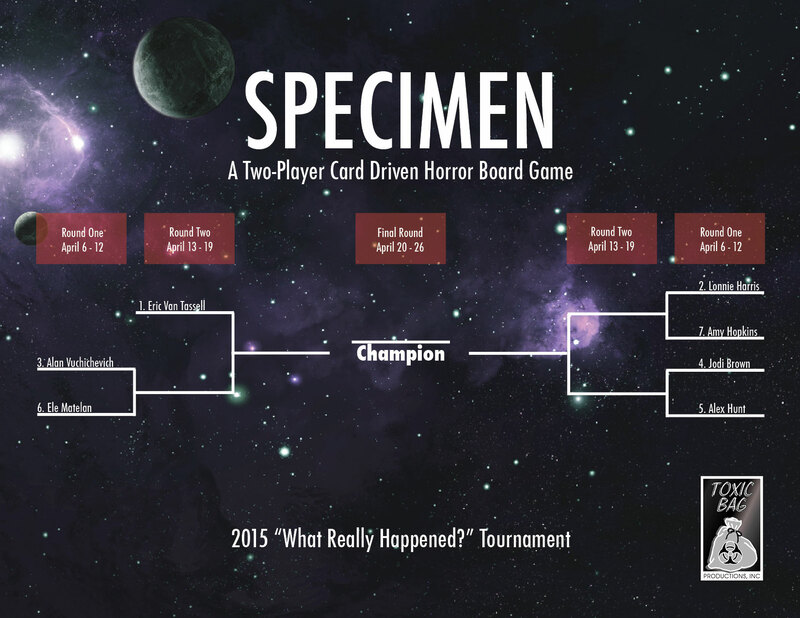 So, we decided to run a special Specimen tournament, with the final game being used to determine the history. In honor of the NCAA men and women’s basketball tournament, we’re calling it Specimadness. First, we got in touch with seven really good Specimen players (cause there are seven crew members in the game – get it?) and asked if they were interested. Once they were all on board, we put together this nifty bracket and started scheduling the games. It should be a lot of fun. We’ll be posting AARs of the games, so stay tuned faithful readers! Here’s a cool trailer showing what’s coming up at the end of the season on The Flash. Some exciting stuff from one of the truly great new shows. p.s. More Grodd!!!! How cool is this gonna be??? Back in December of 2014, I was lucky enough to be a finalist in Wildclaw Theatre’s Deathscribe 2014 festival. Here is a review of the night’s activities that we found on line. These guys do a really good job of reviewing all five stories as well as saying who they would have selected as the winner and why. They also have some really nice things to say about my story, which is a plus! Check this out! I’ve only seen three of them. Guess I’ve got some film watching to do! How many of them have you guys seen? I’m humbled and honored to have my script selected as one of the five finalists for Deathscribe 2014. It’s going to be an awesome night. If you’re going to be in Chicago on December 1st, and are looking for some spooky fun, please check it out! If you go, stop on by and say howdy! Hey guys, in this months podcast I mentioned several articles during the Popculture Update.